Did you know that computer centres are like people? They breathe air in and out like a person, they have to be kept at the right temperature, and they can even be organ donors. As part of a regular cycle of equipment renewal, the CERN Computer Centre has just donated 161 retired servers to universities in Morocco. 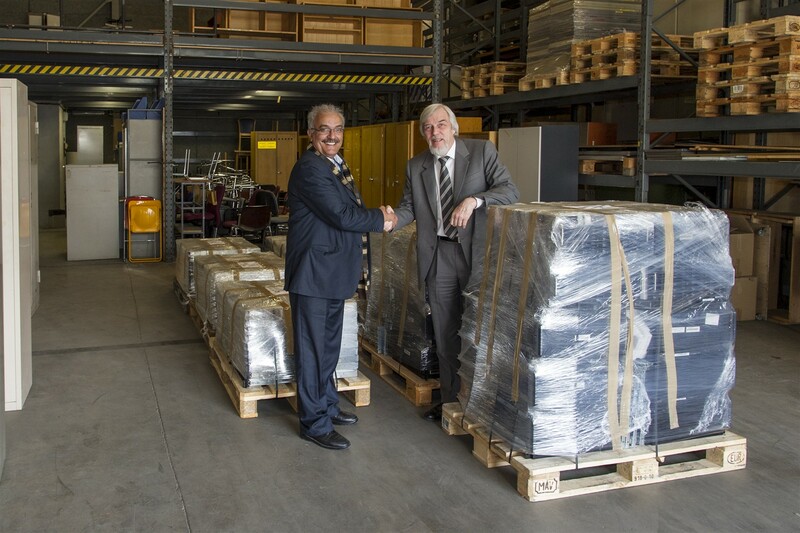 Prof. Abdeslam Hoummada and CERN DG Rolf Heuer seeing off the servers on the beginning of their journey to Morocco. “Many people don’t realise, but the Computer Centre is like a living thing. You don’t just install equipment and it runs forever. We’re continually replacing machines, broken parts and improving things like the cooling.” Wayne Salter, Leader of the IT Computing Facilities Group, watches over the Computer Centre a bit like a nurse monitoring a patient’s temperature, especially since new international recommendations for computer centre environmental conditions were released. “A new international standard has increased what is known as the inlet temperature for modern computers to up to 27°C,” he explains. “This means we have to cool the air going into the computers less. We’re now blowing air into the Computer Centre at 22°C instead of 14°C, so this represents a major saving in terms of energy.” Along with other changes made in the cooling systems, most notably making more use of free cooling by outside air, the Computer Centre has been able to reduce its electricity consumption by 4.5 GWh per year. While the servers may be being retired from the cutting-edge use needed at CERN, it doesn’t mean they are not still perfectly good for less demanding uses elsewhere. On 8 March, 161 servers were loaded onto a lorry bound for Morocco. About half of them will go to build a Tier 2 Grid centre in Rabat, the capital, while the other half will be distributed to the RUPHE network of the four main high-energy physics institutes in the country. “The servers should allow Moroccan scientists, who are mainly collaborating with the ATLAS experiment, to analyse LHC data at their home institutions,” says Rolf Heuer, CERN Director General. The shipment is the realisation of a promise made by CERN back in May 2011 during the “Sharing knowledge across the Mediterranean” conference.